of PA jobs is 03-07-2017. These posting will be at all over UP Subordinate Courts under Allahabad High Court. Interested candidates can submit their application online using official website of Allahabad HC @allahabadhighcourt.in. Selection for this recruitment will be held based on written test, Shorthand Test and no Interview. 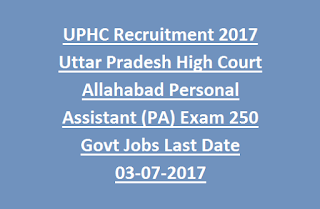 For more details regarding Allahabad HC Recruitment age limits, exam pattern, educational qualifications and for more see the given below information. 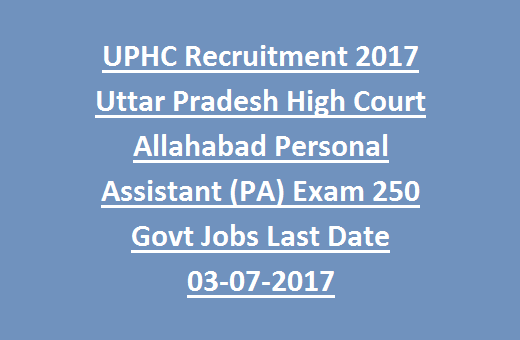 There are total 250 vacancies available in this current recruitment of UP HC Allahabad. For General candidates 18 to 40 years, For OBC/ST/SC candidates 18-45 years and for ex serviceman upper age limit is 43 years, for disable persons maximum of 55 Years. English Shorthand with minimum 100 WPM and typewriting speed of WPM. Computer Knowledge-Computer Operation, Word Processing and Data Entry. Preference will be given to the candidates those who are having the additional skills of Hindi Type Writing and Shorthand with 30 WPM and 80 WPM respectively. Selection will be held in two stages. Written Test Consists of 100 marks with two parts. Sllabus for the below concepts are degree level only. Eligible candidates can apply online only and before applying must read the instructions and upload a photo and signature without fail and pay the fee in time and submit the application on given dates. Please take a printout of application copy after successful completion and keep it with you for further requirement.